The Selling Point: With having oily skin, I'm always on the look out for oil-free products, however, when it came to getting an Eye Make-Up Remover, it seemed even more important, because I always have issues with Eye Make-Up Removers being too greasy. Greasy Removers first of all irritate my already sensitive eyes, and secondly, they always seem to be incredibly messy. I've used Simple's Remover before, so I already trusted it, but seeing that it's 100% Oil-Free was a huge bonus! Plus, the 50% Extra Free was a great selling point too. Will it Pass the Test? The biggest issue that the Remover had to face was my Barry M Mascara, which is waterproof, and as regular readers might remember from a past blog, I had a nightmare trying to get the mascara off with the cheap-brand Remover I had. Soo, did Simple's work? It sure as hell did!! And, I was over the moon that it did...although, not as over the moon as my poor eyelids were...they wouldn't take anymore excessive scrubbing!! Although it removed the mascara, it was still incredibly gentle on my eyes, and it didn't irritate them at all. The formulation is more like water, which I assumed was a result of not being oil based. Who is this product perfect for? Anyone with sensitive and/or oily skin. 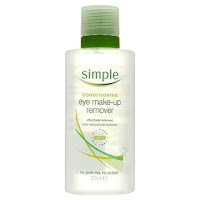 "one little old lady wishes to comment on Simple eye make-up remover as recommended by you. Well I tried it. And I was impressed. It was much better than the over greased eye pads I'd been using. Very gentle and effective.The fact that it was on-offer at £1.99 was even better!!!!"